Choke is a common term for esophageal obstruction. The esophagus is the tube that runs from the throat to the stomach. If a horse does not chew and soften their food properly, food can become lodged in this tube, causing a blockage. This disorder is called “choke”, as the horse can look as if they are choking. They can retch, cough, act colicky, even become violent with pain. Choke occurs more frequently in the winter as more horses get grain, and they may eat faster as they get very hungry. Choke can be avoided by feeding all grain, especially grain that has some pellets or is all pellets WET. Adding equal amounts of water at feeding time can also be helpful. Beet pulp and senior feeds are the most common feeds to cause choke. Soak well!!!! If you suspect your horse might be choking, take all food away from him and call your veterinarian. http://blueridgeequine.com/wp-content/uploads/2017/02/stall-pic-Earl-Turner.png 2040 1885 Dr. Jennifer LaPlume, VMD http://www.blueridgeequine.com/wp-content/uploads/2012/10/logo.png Dr. Jennifer LaPlume, VMD2016-01-29 08:44:492018-07-16 14:10:02Is My Horse Choking? In certain cases a cast can be extremely beneficial in wound healing. This case is an example of a wound that benefitted from a cast. This horse got her foot stuck in some fencing and avulsed (tore off) part of her hoof wall along with doing a lot of tissue damage to the pastern area. When the wound was initially treated it was bandaged and started on antibiotics. One week later when we were past the infection stage, we put a foot cast on her. The cast acted as a bandage and kept the wound clean and protected. It also stabilized the foot and coronary band which hopefully allows for healing that most closely resembles normal tissue. This was extremely beneficial because there is a lot of movement in the foot area this can prolong wound healing. We left this cast on for 3-4 weeks. During this time the horse was kept in a stall with handwalking or in a very small dry paddock. The owner closely monitored for any cast sores or increase in lameness. We removed the cast at 3 weeks to see what healing we had. At this point we had lots of healthy granulation tissue filling into the wound site. We were so happy with how things were healing that we applied another cast after cleaning the wound and repeated the same process for another 3-4 weeks. At this point we felt we had enough healing that another cast was not needed and we proceeded with some special shoeing along with a light bandage. At no point did we have to worry about extra granulation tissue or proud flesh. Casting can be very helpful in cases where there is a lot of movement in the area that is slowing the healing process, along with saving the owner money on bandage supplies. The main risks associated with casting are cast sores or casting with an infected wound underneath that deteriorates underneath the cast. Continue turnout unless it is very icy. In deep snow, older horses or horses with lameness or neurologic issues may need to be kept in, or have limited turnout. -Try to provide a water source that is warmed and convenient for them to reach. If not warmed, REMOVE ice from troughs and buckets at least 2 times a day. Do not rely on streams for water in the winter. -Put salt on feed and hay to encourage them to drink. -Cut grain if they are going to be in or not moving around much. Do not increase grain! -DO NOT OVER FEED HAY. Feed the normal amount only. You can increase after 5-7 days gradually. -Monitor manure production if possible. If not passing manure, decrease food offered drastically. -If in a stall, hand walk 10 min/2-3 times a day in available areas. -Monitor alpha/head horse(s) for bullying, remove if guarding water, feed or shelter. -Do not close up the barn. Keep at least some windows or doors open for ventilation. -In an ice storm, keep horses in until the ice has melted. If they must be out, provide traction with manure, shavings, ashes, hay or sand. Remove shoes or tape feet with elastikon for traction. -Remember, a hungry horse is better than a colicky horse! -Make sure your emergency medications are on hand. Water – A heated source of water will increase water consumption. There are many different types of heaters available. The best ones for troughs are those made to fit in the drain holes of the troughs. There are also individually heated buckets. For older horses with sensitive teeth, heated water is much preferred by them. A leading cause of intestinal impaction colic is a decrease in water consumption. Soaking hay and feed can also increase water consumption. Turnout in the winter is very important to maintain regularly. It may feel cold to you, but horses are designed to live outside. Additionally, their GI system is directly affected by how much time they spend walking. If they do not walk, their GI system slows down. If the GI system slows down, they can get intestinal impactions and/or colic. The only weather that should keep a horse from going out in is thick ice on the ground. Keep them out! You will see me less! Salt: Even though it is cold, your horse still needs salt. http://blueridgeequine.com/wp-content/uploads/2012/10/snow-picture.jpg 453 604 Dr. Jennifer LaPlume, VMD http://www.blueridgeequine.com/wp-content/uploads/2012/10/logo.png Dr. Jennifer LaPlume, VMD2016-01-11 15:53:462018-07-16 14:14:43Extreme Weather Tips! Is It Time To Retire My Horse? Let us know if you’d like help evaluating the most suitable job for your equine partner. http://blueridgeequine.com/wp-content/uploads/2015/08/fall-jumping-e1448900272315.jpg 458 501 Anne http://www.blueridgeequine.com/wp-content/uploads/2012/10/logo.png Anne2015-11-30 11:19:112018-07-16 14:19:29Is It Time To Retire My Horse? 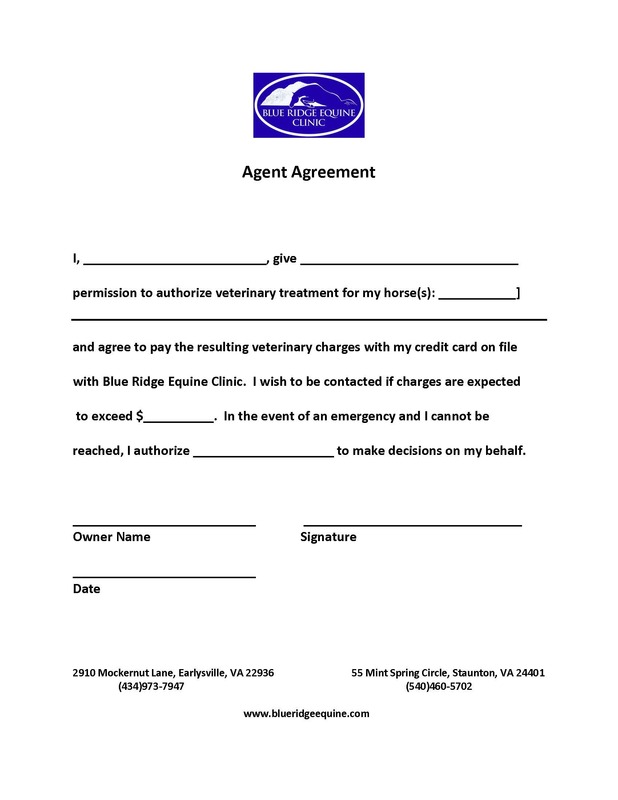 At Blue Ridge Equine Clinic, our goal is to always provide the best quality equine veterinary care for our patients and their owners. We strive to do so at a reasonable cost and as such, want to make you aware of an industry wide increase in the cost of fluids. As availability of intravenous (IV) fluids continues to be impacted by regulatory constraints and human health demand such as dialysis, our cost to secure fluids for our patients has risen. Due to increased manufacturing costs from our external suppliers, clients will incur a price increase if fluids are required for the care of your animal(s). Many of our suppliers have absorbed a portion of the increased supply cost in their effort to minimize the impact on veterinarians and equine owners. Although our suppliers have taken actions to increase capacity, we expect continued supply challenges throughout 2015 and 2016. As always, your animal’s care is our primary concern. Please let us know whenever we may be of help in any way. We appreciate the trust you place in us. Many people go away in the summer. Please take the time to prepare your horse sitter. Your sitter should be willing and able to care for your horses in your absence. Ideally, your sitter should check on the horses in the morning and evening. Before you leave, have your sitter come over during a feeding time to go through your routine. As accidents and illnesses can occur any time, do not leave your horse sitter without directions in case of an emergency: “In Case of Emergency” form that should stay with your horse. Discuss with them your wishes in the case of colic and injuries that require hospitalization and surgery. Tell them how much you are willing to spend. Arrange for transportation or allow the sitter to use your trailer. Make sure they have your horse’s insurance information. If you are going to be away for a long time or will be completely out of touch, it is a good idea to use two horse sitters in case one of them becomes unavailable. * Make sure your horse has access to plenty of clean water. You should check troughs and streams daily. Salt blocks should also be available at all times. * Horses in work should have electrolytes added to their feed daily. Use the type without sugar (sucrose/dextrose). * Ride during the coolest part of the day if possible. * Fly control: Use fly spray, fly masks, fans, remove and compost manure, and cover wet/muddy areas with blue stone. * Make sure your horse is sweating properly. “* Thunder storms: Do not run out to bring your horses in during a storm. This is not safe for you or for them. If you know storms are on the way and you have time, bring them in. They are safer in the barn. * Sun burn: Apply sunscreen to the noses of horses with white or flesh colored markings to prevent sunburn. Zinc oxide products seem to work the best. * Potomac Horse Fever prevention: Turn off outside lights, including arena lights at night. The light attracts mayflies and similar insects that are proven to carry and infect horses with the PHF organism. Now is also the time to vaccinate for PHF if indicated. * Foot problems: Horses may develop foot issues due to stomping flies and hard ground. 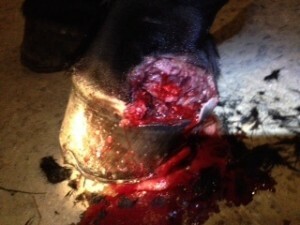 Work with your farrier and keep horses in during the stomping hours”. * Treat cuts and scraps promptly to prevent infection. * Body clip horses that have not shed out properly due to Cushings/PPID. Some may need to be clipped several times during the summer. How does the level of trust between client and veterinarian affect the patient? Does it have any impact? Consider a call received from a barn manager : a new boarder’s horse is displaying signs consistent with colic onset (kicking at stomach, rolling, sweating, biting at sides) and the barn manager requests the vet approve a dose of Banamine and come out as soon as possible. The veterinarian has never met or spoken to the owner. Absent a thorough boarding agreement allowing the barn manager to approve care up to a specified dollar amount, should the veterinarian treat the horse if the owner cannot be reached? Or assume the veterinarian has seen a horse twice for routine care (vaccines, Coggins tests, etc.) and another owner at the barn notices the horse is on three legs, reluctant to put any weight at all on a limb, and requests a visit as soon as possible. The owner is overseas and has not responded to a message left. veterinarian can make the difference between a quick response or a delay that may cause the horse to be in pain longer than necessary or even make the difference between life and death. The familiarity of a client and his/her feelings about treatment options, treatment occurring without the owner present, financial considerations, and accessibility of the horse’s history are all critical in delivering the most appropriate care in the shortest amount of time. There is no substitute for a veterinarian familiar with your horse, the horse’s history and the confidence of knowing you trust them to make the best decision for your horse if you cannot be reached. Guesswork is taken further out of the equation when you have a written directive on file (basic example attached. You may wish to consult an attorney to determine legality) with the practice or your boarding facility, specifying dollar limits for work done without your consent. We have clients who we know would choose to have certain horses sent for emergency surgery and others for whom that is not an option. One is not right or wrong, but it sure makes the veterinarian’s job much easier if the owner’s wishes are known. Like wills, medical directives, and the like, directives for equine care are not things we like to think about, but are important. If you haven’t already, consider putting in writing instructions for your horse’s medical care, including dollar limits, if you cannot be reached. Give copies to your veterinary practice, to your barn manager and anyone who cares for your horse. Our goal is to provide the very best care for your horse, every time, in accordance with your wishes. We want to be your partners in equine health care; please let us know whenever we may be of help. Broadmore is a sweet, jet black, miniature horse. On October 5th, 2010, he was referred into the hospital by David Ordel, the owner of the farm where Broadmore was boarded. He was a quiet, 7 year old gelding, who was showing signs of persistent colic. He was diagnosed with a large colon impaction colic. This problem generally has a good prognosis but the owner declined treatment. As Broadmore was young and had an excellent chance to be saved with aggressive treatment, we asked the owner if they would donate Broadmore and they agreed. Mr. Ordel then agreed to find a home for him if we could resolve the impaction. Dr. Paul Stephens and his team treated him free of cost with high volume fluids and electrolytes and after 36 hours the impaction was cleared. Upon Broadmore’s discharge, Mr. Ordel said; “if you know of anyone that might want him, give them my number, I will take care of him in the meantime”. I immediately called the owners of the farm where my horse is boarded to see if they might be interested and they informed me that their neighbors were actually looking for a miniature horse. I called them up and gave them David’s number. They adopted him in November 2010; that winter, their daughter, Rachel, began to work with him, doing showmanship, obstacle, jumping and driving. They went to their first show in the spring of 2011 and have been going non-stop since then. 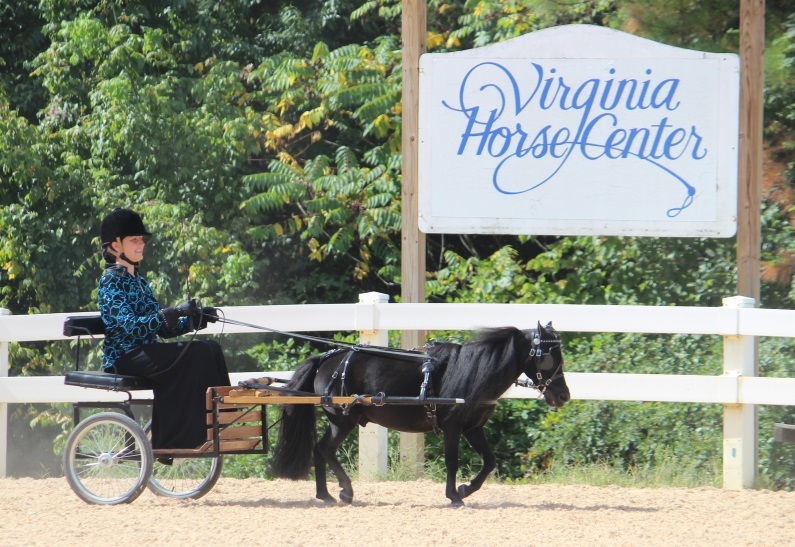 Rachel and Broadmore have shown at the World Class Miniature Horse Show, the Virginia Miniature Horse Club shows and the Varina Rising Stars 4-H horse shows. Broadmore has been her 4-H project horse for the past 3 years. 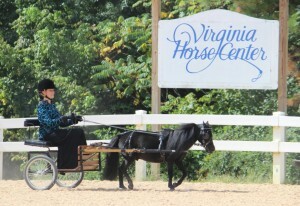 In 2012, this unstoppable pair won the driving classics at the Virginia State 4-H horse show in Lexington, Virginia. Together, they have numerous year end Championships and Reserve Championships. In the summer of 2013, Rachel researched Broadmore’s name and found his bloodlines, they were able to contact the breeder, who was really amazing. The breeder found Broadmore’s original papers and mailed them to Rachel with transfer papers. Turns out, his registered name is Silver Plates Baccarra Broadmoor. In January 2014, the pair, along with Rachel’s 4-H club, the Silver Stirrups 4-H club, had the honor of participating in the inaugural parade for Governor-elect Terry McAuliffe, to represent the Virginia Cooperative Extension 4-H Youth Development Program and the equine industry in Virginia, which also made the front page of the local newspaper. Rachel continues to train and show Broadmore, along with her two other miniature horse additions. It feels great to have been a part of this little guy’s life and I am excited to see what else he and Rachel have to show us in the future.